Photo by Vicki's Nature, Flickr. CC License. Last night our heatwave finally broke, and this morning we woke to fresh, cool sunny weather. The calm was pierced by the raucous cry of a large bird. I peered out from the screened porch and saw our resident male pileated woodpecker on a nearby tree. What a sight! Marcia Bonta describes the pileated to be like a miniature pterodactl, not a bad comparison. It is the largest woodpecker. The pileated is also a loud bird. Ms. Bonta's description: "Pileateds are also the big mouths of the woodpecker world, their demonic-sounding laughter echoing from ridgetop to ridgetop as they keep in touch with their lifelong partners. In addition, both male and female pileateds are master drummers, and frequently proclaim their dominion over the territory that they hold until they die. And, when one or the other partner does die, the surviving mate holds on to their territory and waits for another mate to appear." Aftenposten reports that on Wednesday morning a major sized meteorite hit earth in northern Norway. This news seems to have been eclipsed by the death of Mr. Zarqawi via man-made bombs dropped from the air. The article has a photograph of the meteorite as it is entering the earth's atmosphere and leaving at trail in clear skies. For those of you who read Norwegian (not me!) here is another article, along with what looks to be a photo of the impacted area titled "Her landet meteoritten" - click to look at the bigger version. Further Google searches haven't turned up any other references to this event. Hat tip to Memeorandum. We seem to have a Great Crested Flycatcher visiting our house, possibly for the summer. It is hard to miss this bird as it has a very loud (possibly obnoxious?) "wheep" call that it likes to repeat early in the morning right outside of the bedroom. Perhaps the only more annoying bird I can think of is the Whipporwill, which goes on and on and on at 3 am in the morning. In any case, this is a new bird for us, and seems to be somewhat unusual, so we must tolerate, if not enjoy, the cacaphony. This website has a very nice photo and description -- the yellow belly is well depicted although the crest isn't so evident here. According to Chipper Woods Bird Observatory (which has detailed pictures and more scientific description): "Great Crested Flycatchers perform a natural pest control service. They consume more than 50 kinds of beetles, along with wasps, bees, sawflies, stable flies, mosquitoes, grasshoppers, crickets, katydids, moths, caterpillars, cicadas and other insects. Their diet also consists of various berries such as mulberries, pokeberries, blackberries, wild grapes and others." Anything that can reduce our mosquito and grasshopper population sounds good to me! Yesterday, we saw (most likely) an owl flying through the woods at our property on the shore in Maine. The owl was being mobbed by crows and was a very large, brownish bird, most likely a great-horned owl. It flew through the woods, took another stand in a tree, but the crows were relentless. This article on Owl Spotting indicates that one way to spot a Great Horned Owl is when crows are mobbing the owl. It also says that the owls may leave a whitewash on the branches and trunks of the trees. Here is an interesting thread of discussion regarding whether the mobber or mobbee end up as a fatality. 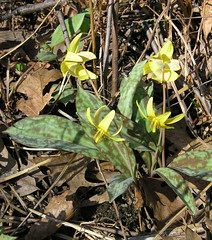 During our last visit to Vermont, we found these beautiful yellow Trout Lilies (aka Dogtooth Violets, Erythoronium americanum) along the side of the road. For some more pictures and description, see here . 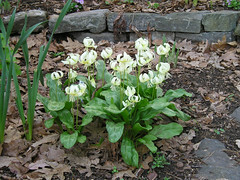 Below is a photo of a wonderful clump of white dogtooth violets in our garden in New England, U.S. 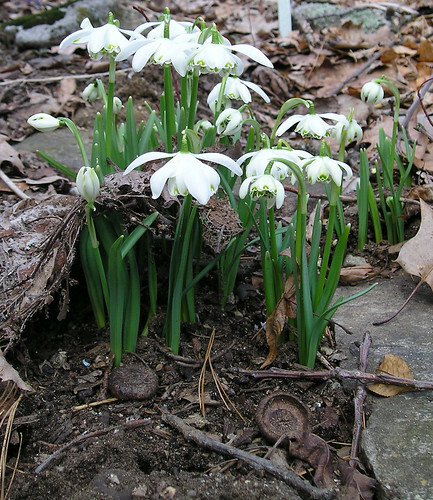 These are one of my favorite spring flowering plants. A gorgeous pink variety of this plant known as Katakur can be found in Japan on the Mt. Toyasan climbing road. Another variant with a very delicate flower can be found in Idaho. It appears that the nest that I linked a webcam for may be infertile. This page has considerable background on the nest, interesting conjecture about why the eggs might be infertile, and some pictures. Worth a visit. Most of us either never see a yellow-bellied sapsucker, or only see one that is working on a tree. Unfortunately a male yellow-bellied sapsucker met up with a window on the front of our house, and that was the end of him. It did allow me to get some very close-up photos of the bird, which has very dramatic red on its head and chin. I hope my readers don't find the photo below too gruesome. There are several more at my Flickr site. 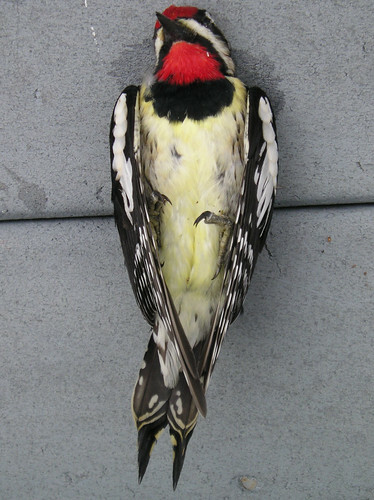 Sapsuckers are a type of woodpecker. According to the Cornell ornithology website, sapsuckers "drill small sap wells in regularly spaced rows or columns on tree trunks. They eat the exposed inner bark and cambium and drink the sugary sap that flows from these pits. Yellow-bellied Sapsuckers have been found to tap over 250 species of trees and vines. Sap composes up to 20 percent of their diet and is especially important in late summer and autumn, or any time when other food sources are scarce." The clocks are changed ("Spring Forward"), the sun is shining, and I genuinely feel that spring is here. 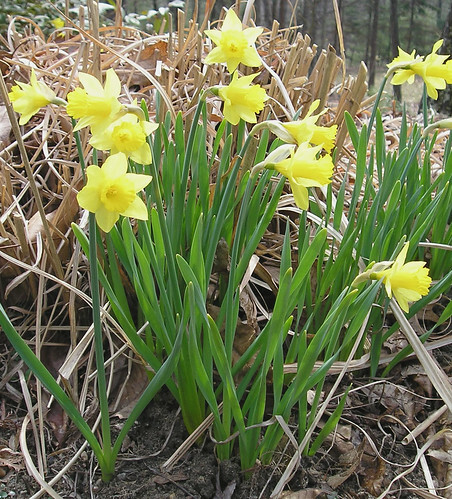 It seems that our bulbs are blooming early - daffodils right along with the snowdrops! The nom de plume for this blog is a very grand elm tree that lives in Down East Maine. It lives in lonely splendor, next to a field with old apple trees, a stone wall, lilacs, and beach rose hedges. The lonely splendor is key, as without that it probably would not still be with us. One foggy day, we met a gentleman with a camera admiring the elm tree. He photographs large trees. He measured it and left us with material on how to take care of old elm trees. So far, we haven't done anything, and the tree continues on. Many of us have a fascination with large old growth or other big-tree specimens. Today's Boston Globe has a wonderful article on big trees and big tree hunters, along with contacts. Here is a nice essay on finding elms in the wilds of Vermont and considering what had been. This site has a compilation of historic trees, including one elm in Minnesota. ChampionTree.org talks about what makes a champion sized tree, and a photo gallery of big trees. This short Smithsonian article discusses the progress in creating an elm that is not so susceptible to disease and has some nice photos. This site has eight photos showing the various features of an elm tree, which normally has the shape of a vase flaring out at the top.